elimae published a piece by my short story 'lifer.' Much thanks and gratitude to Brandon Hobson and Cooper Renner. 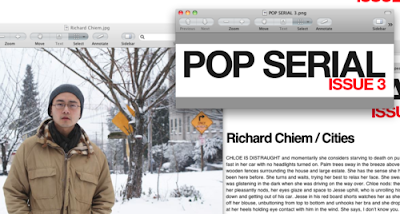 pop serial published my short story 'cities.' Much thanks and gratitude to Stephen Tully Dierks. 1 // Megan Lent re her favorite alt lit couples here . 2 // I AM ALT LIT reviews OH NO EVERYTHING IS WET NOW here. 3 // KRAMER SUTRA by Chelsea Martin is now available here. 4 // Dennis Cooper's 136 surfaces here.